At its heart is Office itself—the familiar Office applications businesses use everyday—now offered as a cloud service, so it’s always up to date. But Office 365 is also so much more. It’s about bringing enterprise-grade services to organizations of all sizes, from online meetings to sharing documents to business-class email. Always up-to-date. 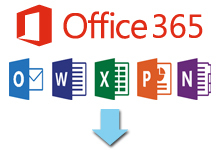 Never buy a new version of Office again! 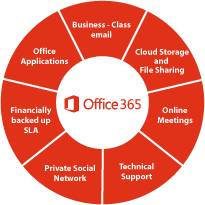 Technical support Have confidence knowing that your Office 365 subscription comes with 24/7 technical support by a global network of experts, with 1 hour response time for critical, service impacting events. Financially backed SLA Get peace of mind knowing your services are available when you need them with a financially-backed 99.9% uptime service level agreement. Delve Analytics uses big data to reveal how behaviors drive business outcomes. Leverage personal and team work analytics dashboards to understand how you actually work, get time back and spend it more effectively.